Salomone Rossi is arguably one of the earliest imporant Jewish musical figures before recent times. He was born in Mantua and lived there for his entire life. Not only was he a prominent member of the Jewish ghetto music circle, he was also appointed by the Gonzaga family of the Mantuan court. Among the other composers serving at the same court during the time included heavyweight Claudio Monteverdi, before his later departure to Venice. Rossi was under the appointment of Dukes Vincenzo and his successor Francesco. According to record, they stated "how dear is the service that for many years Salamone de Rossi hebreo has given to Us, by virtue of his talent as a musico and a player." He was certainly highly regarded, as he was even given permission to not have to display the Star of David on his clothing, something that was required of all Jews then. Rossi, however, was always proud to acknowledge his Jewish heritage, and in all his published works, he would add "hebreo"(Hebrew) to the end of his title. 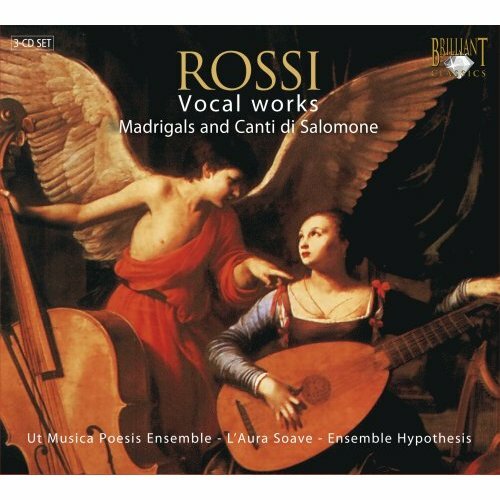 Rossi was fairly active as a composer, as he published quite a few books of madrigals and other secular vocal music. In terms of sacred music, he composed a set of Songs of Solomon, polyphonic liturgical music sung in Hebrew, which were also one of the first of its kind. In fact, the Hebrew texts posed a considerable challenge to the Mantuan printing press of its time. I guess it's no different than installing the proper fonts and languages on your computer to read webpages from certain countries today. Rossi's most novel compositions come from his instrumental works. Rossi was an outstanding violinist of the time, and his pieces show one of the first signs of idiomatic violin writing. He published 4 books of instrumental works, which include the most popular instrumental forms of the time, like the sonata and sinfonia and dances like the corrente, gagliarda, and brando. The sonata and sinfonia would later become one of the staples of high Baroque music, while among the dances, only the corrente would continue to become popular. 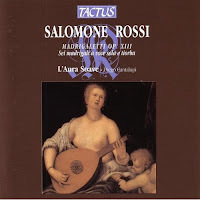 Rossi's biggest innovation was the transforming of the earlier polyphonic canzona, which had a more uniform texture, to that which gave importance to the higher registers and a supporting bass that led the harmonic structure of the music. This apparent separation gave way for more expressive and virtuosic writing, which would plant the seed for the later Stylus Phantasticus. In this sense, Rossi can also be attributed as writing one of the earliest known trio sonatas in music history. The set of Op.13 madrigaletti is one of the last pieces he was to publish. Unlike his earlier sets of madrigals, which are written in the traditional type of four or five voices, which were then going out of fashion, most of these petite madrigals are written for two voices and continuo. In a sense, these were trio sonatas with two of the instrumental parts substituted with the human voice. Sung to the famous poems of its time, most of the pieces are very short, on the order of a minute or two. The longer pieces merely involve the strophic form of using the same melody for the different verses. The voice parts are plain and casual without the dazzling fireworks seen in later Italian operatic arias. The two voices interchange between simple homophony and imitation, but always come back together for the cadence. This secular music is much lighter in mood than the solemnity one has to endure by listening to the sacred music. A big help comes from the continuo, providing the musical drive and different timbre other than just the human voice. I have come to accept that I find music with bass continuo much more attractive than those without, especially with a mixed continuo group that can really have fun. The leader of the Italian group L'Aura Soave from Cremona is the theorbo player Diego Cantalupi, who must be conscious of how the bass continuo can enhance and bring out the flavors of the music, be it a good soft arpeggiated chord here, or a strong emphatic sound there. The continuo group consists of a cello, spinet, and theorbo, covering the range of the bowed, keyboard, and hand-plucked. The effect is more colorful than simply a chitarrone accompaniment seen in many other recordings. As for the vocalists, it's light, clear, and pure Baroque vocal singing, blending well with the continuo instruments. They don't go for anything too dramatic, but rather a smooth and uniform texture. While I generally prefer a more exciting and showy interpretation for instrumental works, I'm surprised at how much I enjoyed this disc, whose music is tame in demeanor. In particular, the pieces sung by the two sopranos gave me much fulfillment, more so than the two tenors. I liken this to watching a sweet little independent film, a nice change-up after watching so many Hollywood action blockbusters. 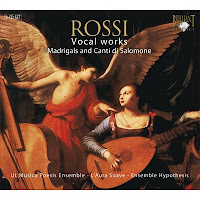 Can't explain it, but it's been a while since vocal music had so much of my attention, and who would expect that it would come from this guy called Rossi?